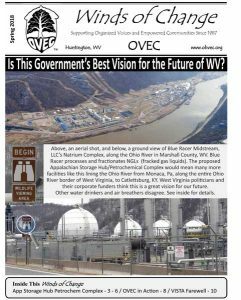 Upon reading this article, Will China’s Appalachian Gas Investments Survive Trade Fight?, OVEC member Mary Wildfire was dismayed to find there was no means to comment upon the article, so she directly e-mailed the author, and shared her e-mail with OVEC’s staff. Now we are sharing it with you, below. 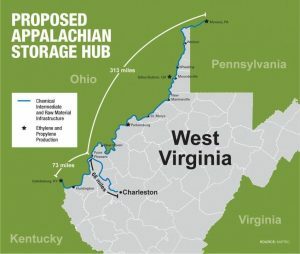 Whenever you read an article that touts fracked gas, pipelines, the “Shale Crescent,” and/or the proposed Appalachian Storage and Trading Hub (ASH, a massive petrochemical complex) without mentioning the downsides, please do comment below the article, if that feature is available. Write letters to the editor, too! If you are incensed by ASH and all the other fracking-related inundation of our communities and want to do more to help get our side of the story out, please e-mail vivian@ohvec.org. Pipelines leak, polluting water; sometimes they explode or create fires. Compressor stations emit air pollution and noise. Cracker plants create all kinds of pollution, and raise cancer rates, as do plastics plants (especially for workers); this area already has high cancer rates, and Parkersburg and Pittsburg already have serious air pollution problems. The complex is supposed to produce plastic—but people are becoming aware of the nasty problem of plastic pollution of the ocean; a young but rapidly growing anti-plastic movement may reduce demand. All of this will add to the problem of climate change. Admittedly, this problem won’t do anything more serious than destroy civilization, possibly cause human extinction, and leave any future generations hating their ancestors as no generation has in all of human history, so no real need to mention something so trifling. There is an assumption that West Virginians will happily trade all of the above harms, and a few I’ve left out, for the jobs and revenue mentioned. And many would. But fact is, we’ve had a full century of schooling by the coal industry in how that plays out: WV is either dead last, or 49th in just about every measure of well-being. We can do better for West Virginia than a massive petrochemical complex! Get active for a better future! 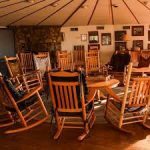 Join and volunteer with OVEC, and/or join other local groups working for a sustainable, regenerative future.